Maybe a snake in the grass trainer Jeff Talley spotted at the Fair Hill Training Center the other day is an omen for 3-year-old filly Stakes On a Plane that he'll send out in Friday's Black-Eyed Susan. Maxis Stable's Stakes On a Plane will also have a lot to handle in the 1 ⅛-mile Black-Eyed Susan. That last race was the Weber City Miss April 21 at Laurel, where Goodonehoney won by seven lengths, with Indy Union second. Stakes On a Plane was challenging for the runner-up spot before she interfered with several horses and was disqualified from fourth to sixth. It turns out, said Talley, she bled badly during the race. She was treated, and will be running Friday for the first time on Lasix. Talley was happy with the filly's two breezes with Lasix and is looking for a strong effort against the likes of 7-2 program favorite Coach Rocks and rematches with Goodonehoney and Indy Union in the field of 10. Stakes On a Plane is 20-1. With rain in the forecast for Friday, Talley says his filly won't be bothered. Claimed after her second race for $25,000, Stakes On a Plane has two victories from six starts. The filly by Run Away and Hide, out of the mare Zeenut, is 1-for-3 this year, the win coming in optional claimer over a sloppy track at Laurel on Feb. 16. Talley, a one-time landscaper, has been training for 15 years. He owned a few horses at the start, but he'd show up at the barn before his trainer so he decided he'd train them. His best horse has been Benny the Bull, who won allowances at Churchill Downs in 2006 and the Iowa Sprint Handicap in 2007 before Talley sold him for $1 million to trainer Rick Dutrow. Benny the Bull went on to win the 2008 Eclipse Award as the nation's top sprinter. 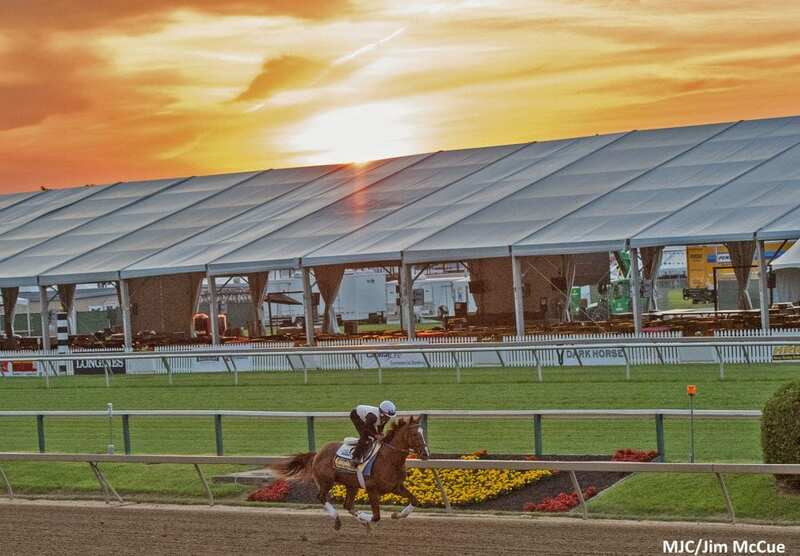 This entry was posted in Racing and tagged 2018 preakness, Black-Eyed Susan, fair hill, jeff talley, stakes on a plane by Press Release. Bookmark the permalink.